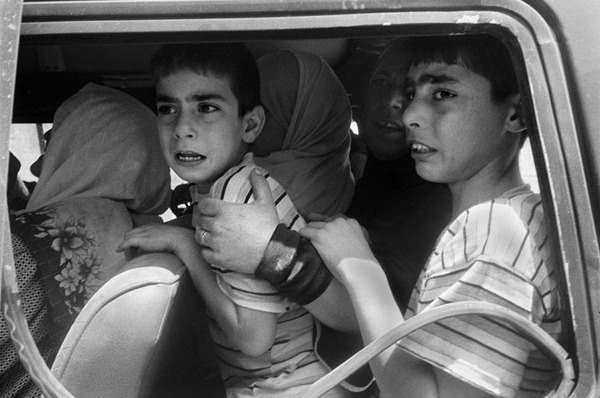 A traumatized Lebanese family from the village of Aitaroun, in southern Lebanon, takes advantage of a temporary halt in Israeli air strikes to flee, August 1, 2006. Aitaroun was the site of a weeklong siege of Hezbollah fighters by Israeli forces. Several families were trapped in their homes for several days while Israeli bombardment flattened many of the homes around them. Farah Nosh, "Lebanon," in POYi Archive, Item #46181, http://archive.poy.org/items/show/46181 (accessed April 18, 2019).